Stopping to think ain’t so bad. Also BEER! So I’ve been reading Neil Gaiman’s Anansi Boys and drinking delicious Czech style Far North Queensland beery goodness. He somehow makes a story about a spider god’s dumpy son into a fate-of-the-world battle of wits. Made me wonder if I could up the stakes a bit in Last Resort, and yup: sure can. Don’t need to change much, just tweak it slightly, and suddenly the Big-Bad just got a lot more believable AND scary. It also ties this book into the over-arching series a bit more. So, my point: not being able to do a lot of writing for a few days can sometimes be a good thing… provided that you still have your brain on the job. And tasty tropical beer. 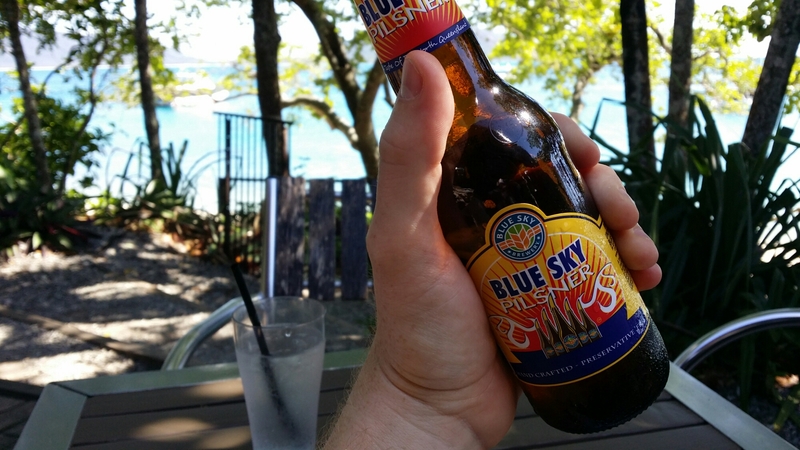 This entry was posted in holidays, Writing and tagged beer, books, far north Queensland, fiction, holiday, Island, Neil Gaiman, Reading, Writing. Bookmark the permalink. 6 Responses to Stopping to think ain’t so bad. Also BEER! I think it was Hemingway that said something like, “Write drunk, edit sober.” XD I think being away from your story a bit can give you some new perspective because you aren’t as close to it. And the beer may have helped, lol. That’s brilliant! And what I shall live by henceforth.